Please Join Us for the Scholars Awards Banquet on May 9th! 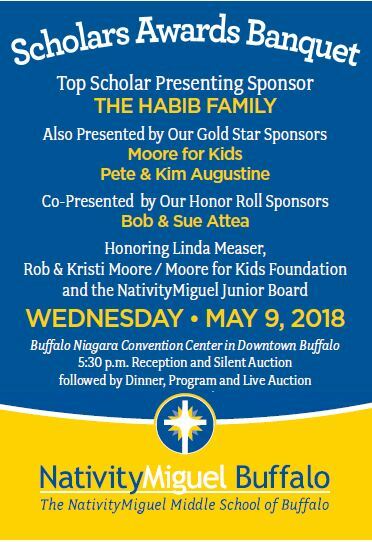 We are pleased to announce that on May 9, 2018 we will be honoring Linda Measer, Rob & Kristi Moore/Moore for Kids Foundation and the NativityMiguel Junior Board at the 2018 Scholars Awards Banquet. The event takes place at the Buffalo Niagara Convention Center beginning at 5:30 pm. For more information, to purchase dinner reservations or sponsorships, or to make a donation, please visit our 2018 Scholars Awards Banquet Website. Thank you for your support!